Not only that, but he was also an FBI informant, who in turn the FBI let him and his henchmen do whatever they wanted on the streets of Boston. It wasn’t until only in the past couple of years until Bulger, who was then in his 80s, was caught, tried in court, and sentenced for the rest of his so called life. There was even a fantastic documentary about him, which you can read about HERE, or more famously, the movie ‘The Departed‘, directed by Martin Scorsese and starring Jack Nicholson and Leonardo DiCaprio. In that film, Nicholson played a character that was based on Bulger. So you get the general gist of who this guy is. Director Scott Cooper (‘Crazy Heart‘, ‘Out of the Furnace‘) wanted to tell Bulger’s story in the form of a feature film that tracked his start as an informant for the FBI and his rise to power as the most vicious kingpin and criminal we the world have seen. 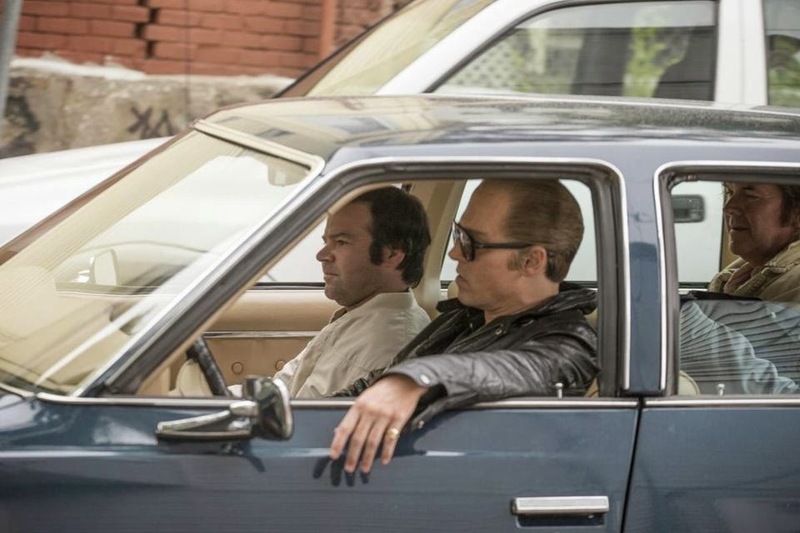 Despite an excellent performance by Johnny Depp (perhaps his best in years), ‘Black Mass‘ is slow crawl to the finish line with episodic editing and far too much dialogue versus violent action sequences as the trailer would lead you to believe. 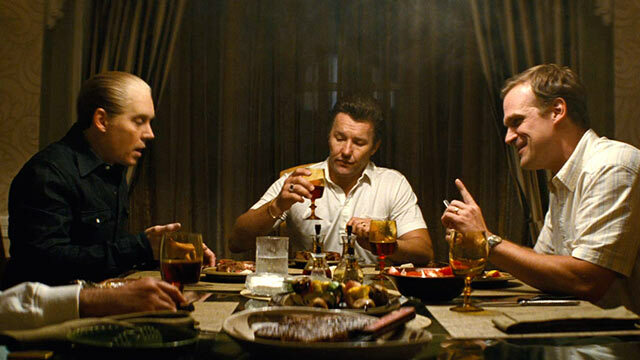 Cooper even tried to mold ‘Black Mass‘ as a Scorsese film in having his characters narrate over the film throughout the two hour run time. Even the narration was bland and unmoving. If you’re looking for a ‘Goodfellas‘ or ‘Casino‘ type of movie here, you won’t get it, even though some of the performances from Benedict Cumberbatch (Bulger’s senator brother) and Joel Edgerton (the FBI contact for Bulger) are amazing. The film slowly treads along and shows us how Bulger and John Connolly (Edgerton), two childhood friends, who form an alliance between the FBI and mafia in exchange for information to take out other mafia outfits out, notably the Italians, to which Bulger and his crew have free reign to wreak havoc on Boston without getting pinched. And yes, this actually happened in real life. As the film progresses, we see more and more FBI agents and officers asking many questions to why nobody thinks to bring in Bulger himself. Add a semi violent scene in the mix, the mix and repeat with the questions and dialogue for over two hours, and you have yourself ‘Black Mass‘. I must admit I was pretty excited for this movie, but its slow pace and mediocre violence made me only want to view this once and never again, as ‘The Departed‘ or the Bulger documentary itself is a far better experience than this movie. The only real shining light here is Depp as Bulger. His emotional and physical transformation is nothing short of haunting and frightening. Those steel blue eyes are as cold as an iceberg when he stares at you, and Depp pulls this off very convincingly. There’s a great scene at a dinner table where Depp scares the daylights out of you and makes you laugh that infamous nervous laugh, as you never know if he’ll snap and viciously kill you. I would not be surprised if Depp received a trophy for his performance here come award season. Yes, Kevin Bacon, Jesse Plemmons, Corey Stoll, Rory Cochrane, and Peter Sarsgaard are in the movie, but their characters are only given a couple of minutes of screen time, that we never get to spend enough time with them to make anything work or feel any remorse, let alone anger. In the end, I wish ‘Black Mass‘ was better, but at least there are other options in regards to this subject matter to watch. This entry was posted on Wednesday, September 16th, 2015 at 8:03 pm	and is filed under Film, News. You can follow any responses to this entry through the RSS 2.0 feed. You can skip to the end and leave a response. Pinging is currently not allowed. « ‘Hart to Hart’ Will See New Life As Series Featuring Gay Couple!! !